But it was Us’ other lead Lupita Nyong’o who stole the show(s). Appearing on The Late Show in a striking pink jumpsuit is one thing, but the Oscar winner topped off her look with a pair of gold contact lenses that had host Stephen Colbert intermittently getting lost in her eerie gaze. 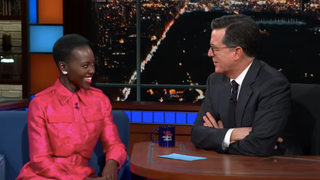 “I’m going for the darkest things in life right now,” Nyong’o purred, fixing Colbert with an expertly catlike stare that had the host momentarily flummoxed. “I’ll try to . . . pay attention to what you’re saying,” Colbert stammered out, before chuckling, “It’s . . . arresting.” Damn straight. Throughout the following interview, Colbert, indeed, managed to listen attentively as Nyong’o explained—in spoiler-free sort-of detail—how working opposite a scary (or scarier, anyway) doppelgänger version of herself meant Us wasn’t as terrifying for her as she predicts it’ll be for the rest of us. Certainly not as terrifying as the poor woman at the film’s recent SXSW premiere, who was definitely not expecting to see Nyong’o—whose made eyeball accessorizing most definitely a thing of late—in the theater bathroom mirror, emerging from the stall behind her. (Naturally, the woman recovered enough to ask the actress for a bathroom selfie, because people are gross.) No doubt presaging the unsettlingly magnetic experience moviegoers are likely to have when we see the movie, Nyong’o kept landing tantalizingly spooky lines on Colbert along with those glowing eyes, as when she responded to Colbert asking if he would fall in love with both Nyong’o’s characters in the film. “It’s a special kind of love you’re gonna have,” smiled Nyong’o, locking eyes on her interviewer, “It’s one you’ll remember, one that might hurt you. But the best things in life hurt, right?” “That’s one hell of a marketing campaign,” said Colbert appreciatively, echoing pretty much everyone watching.